Admirable Women – 15 year old Sarah Merkle Trashes Gun Control in 3 Minutes | It's the Women, Not the Men! Sarah Merkle is a 2nd amendment rights advocate. 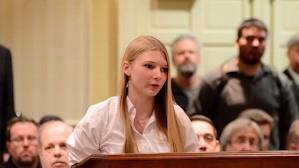 She spoke to the Maryland legislature about the pointlessness of the gun control legislation they were considering. She first shot a gun with her Dad at shooting range as an 8-year-old. Today, she is the secretary for her gun club and shoots competitively with an AR 15, which is the gun under most scrutiny recently. Sarah wants to go to Harvard to become a lawyer on a shooting scholarship but if Maryland passes the legislation they are considering, it will shut the ranges in her area and not allow her to compete in other states as she will no longer be allowed to bring her guns back into Maryland, thereby ruining her chances to enter Harvard. This is a very young woman who is passionate and well-spoken about the citizenry’s right to bear arms. Sarah was willing to expose herself to the inevitable backlash due to her position, in order to express the futility of the politicians efforts to stem gun crimes through the legislation they were considering and more importantly, the collateral damage done to her personally, if indeed the law was passed. Here is a young woman we can all admire for her courage.